Sift flour, baking powder, salt and spice together. Add the sugar, fruit and breadcrumbs and grated suet or melted fat. Mix with the marmalade, eggs and rum, or other liquid. Mix very thoroughly. Put in a greased basin, 2 pt. (1 quart) size. 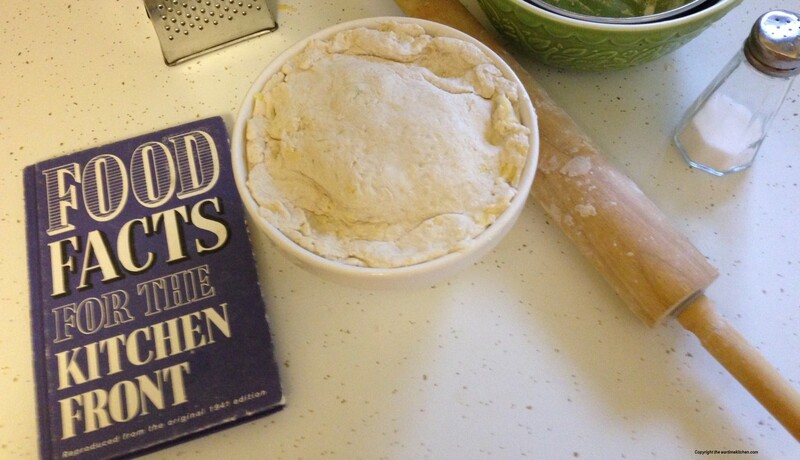 Cover with greased paper and steam for 4 hours. Remove the paper and cover with a fresh piece and a clean cloth. Store in a cool place. Steam 2 to 3 hours before serving. The steaming is best done by standing the basin in a saucepan with water coming a third of the way up the sides of the basin. Keep the water boiling gently over a low heat. It may be necessary to add a little more water during cooking but be sure the water is boiling when added. Mix all ingredients together adding sufficient hot water to give a soft consistency. Use for stuffing meat and poultry. 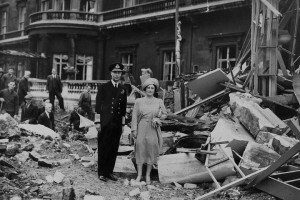 During the Blitz, Buckingham Palace and the grounds were struck on sixteen separate occasions, with nine being direct hits. Even the King and Queen were not immune to Hitler’s onslaught on London. 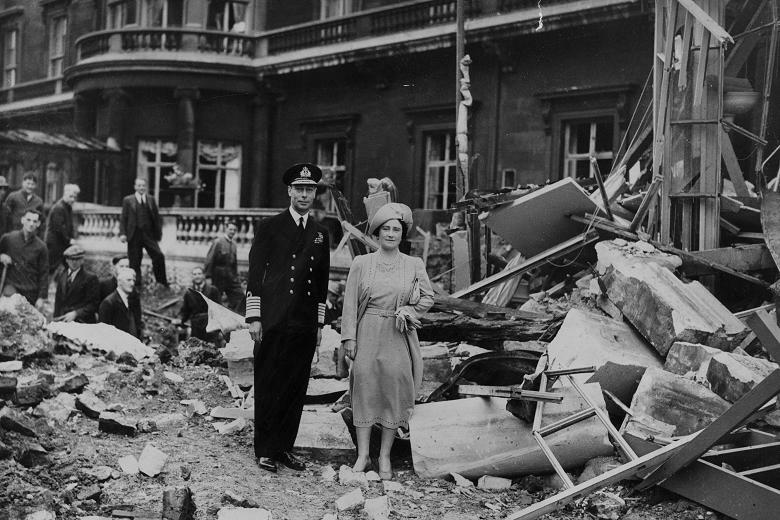 On September 13th, King George VI and Queen Elizabeth were having tea at the Palace when a bombing occured; the royal couple escaped unscathed. Good wishes poured in from around the Empire thankful that the monarchs had not been hurt. After this particular attack, the Queen expressed, “I am glad we have been bombed. It makes me feel I can look the East End in the face.” The King’s Christmas Message of 1940 would prove to be particularly poignant. “In days of peace the feast of Christmas is a time when we all gather together in our homes, young and old, to enjoy the happy festivity and good will which the Christmas message brings. It is, above all, children’s day, and I am sure that we shall all do our best to make it a happy one for them wherever they may be. War brings, among other sorrows, the sadness of separation. There are many in the Forces away from their homes today because they must stand ready and alert to resist the invader should he dare to come, or because they are guarding the dark seas or pursuing the beaten foe in the Libyan Desert. Many family circles are broken. Children from English homes are today in Canada, Australia, New Zealand, and South Africa. For not only has the manhood of the whole British Commonwealth rallied once more to the aid of the Mother Country in her hour of need, but the peoples of the Empire have eagerly thrown open the doors of their homes to our children so that they may be spared from the strain and danger of modern war. And in the United States also, where we find so many generous loyal friends and organisations to give us unstinted help, warm-hearted people are keeping and caring for many of our children till the war is over. But how many more children are there here who have been moved from their homes to safer quarters? To all of them, at home and abroad, who are separated from their fathers and mothers, to their kind friends and hosts, and to all who love them, and to parents who will be lonely without them, from all in our dear island I wish every happiness that Christmas can bring. May the new year carry us towards victory and to happier Christmas days, when everyone will be at home together in the years to come. To the older people here and throughout the worlds I would say – in the last Great War the flower of our youth was destroyed, and the rest of the people saw but little of the battle. This time we are all in the front line and the danger together, and I know that the older among us are proud that it should be so. Remember this. If war brings its separations, it brings new unity also, the unity which comes from common perils and common sufferings willingly shared. To be good comrades and good neighbours in trouble is one of the finest opportunities of the civilian population, and by facing hardship and discomfort cheerfully and resolutely not only do they do their own duty, but they play their part in helping the fighting Services to win the war. Time and again during these last few months I have seen for myself the battered towns and cities of England, and I have seen the British people facing their ordeal. I can say to them that they may be justly proud of their race and nation. On every side I have seen a new and splendid spirit of good fellowship springing up in adversity, a real desire to share burdens and resources alike. Out of all this suffering there is a growing harmony which we must carry forward into the days to come when we have endured to the end and ours is the victory. Then, when Christmas Days are happy again, and good will has come back to the world, we must hold fast to the spirit which binds us together now. We shall need this spirit in each of our own lives as men and women, and shall need it even more among the nations of the world. We must go on thinking less about ourselves and more for one another, for so, and so only, can we hope to make the world a better place and life a worthier thing. And now I wish you all a happy Christmas and a happier New Year. We may look forward to it with sober confidence. 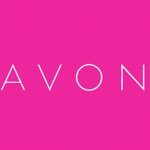 We have surmounted a grave crisis. We do not underrate the dangers and difficulties which confront us still, but we take courage and comfort from the successes which our fighting men and their Allies have won at heavy odds by land and air and sea. By the time Christmas, 1940 had arrived, more than 24,000 civilians had been killed in the Blitz and hundreds of thousands of people had become homeless. Before the start of the holiday season, German bombers had obliterated Coventry in November and Nazi raids on Manchester and Liverpool had been made just before Christmas. With the sound of an air raid siren, many families went to their Anderson shelters for long periods of time, often spending many nights there as bombs fell on Britain. 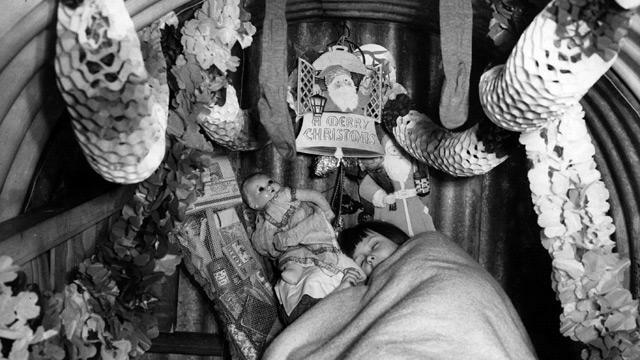 At Christmas, these air raid shelters and sometimes other places of safety were festooned for the holiday. By 1940, short Christmas trees were in high demand due to the limited height of the air raid shelters. Even with bombs dropping over many British cities, entertainment was still available: the BBC broadcasting the “Kitchen Front,” the King’s annual wireless (radio) Christmas message, and upbeat variety shows. A Christmas sermon was broadcast from the ruins of Coventry Cathedral by the BBC, and church services continued (as long as there was no bomb-damage). Church bells were not allowed to be rung, as this signified a Nazi invasion, and due to the black out, Britons could not illuminate their windows. When Britain went to war with Germany in September 1939, it was not uncommon for the British people to hear, “It’ll all be over by Christmas,” just as it had been said that World War One would be over by Christmas, 1914. Sadly, the war would go on through five more Christmases until May 1945, when World War II finally came to an end in Europe. As the war effort went into full swing with wartime production and increased farming, summer holidays came to an end; due to the war and blackouts, Guy Fawkes’ night had disappeared ; with food rationing, Easter eggs disappeared; but Christmas was one holiday that would not be diminshed! An excellent way to look at the British home front during the war years is to take a look at how Christmas was celebrated between 1939-1945. 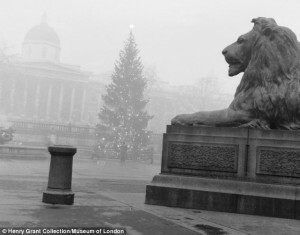 In London, throughout the towns and villages, on farms and in the cities, by rich and poor, old and young, Christmas continued to be celebrated all over Britain and throughout the Empire. As soldiers were sent all over the world, Christmas became even more important holiday so a bit of continuity could be kept as a reminder of home. 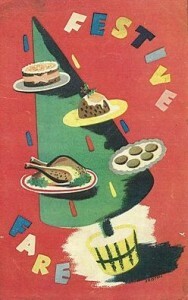 Christmas would not be as rationed in 1939 as it would be in the coming war years. 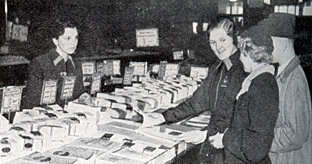 Much of the Christmas production has been completed prior to the start of the war, and the shelves at F. W. Woolworth’s Three Penny and Six Penny stores were full of Christmas merchandise.